Get out of town with these interesting Wurzburg side-trips: Rothenburg (Stadt Rothenburg ob der Tauber, St. Georgs Brunnen, & more). There's much more to do: step into the grandiose world of Würzburg Residence, savor the flavors at Weingut Staatlicher Hofkeller, get engrossed in the history at Marienburg Fortress, and steep yourself in history at Schloss Veitshöchheim. 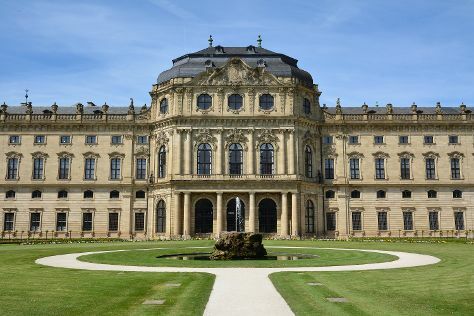 For more things to do, where to stay, reviews, and more tourist information, use the Wurzburg itinerary planning website . New Delhi, India to Wurzburg is an approximately 14-hour flight. The time zone difference when traveling from New Delhi to Wurzburg is minus 4 hours. Plan for much colder temperatures traveling from New Delhi in September, with highs in Wurzburg at 22°C and lows at 10°C. Finish your sightseeing early on the 22nd (Sat) so you can take a train to Nuremberg. 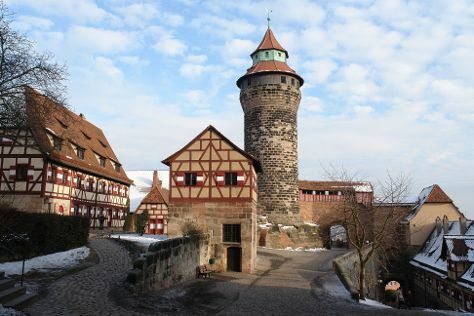 Explore the numerous day-trip ideas around Nuremberg: Bamberg Altstadt (in Bamberg), Regensburg (Cathedral of St Peter's & Old Stone Bridge) and Hermitage Castle (Altes Schloss Ermitage) (in Bayreuth). There's still lots to do: explore the historical opulence of Kaiserburg Nurnberg (Nuremberg Castle), steep yourself in history at Albrecht Durer House, take in the spiritual surroundings of St. Sebaldus Church, and see the interesting displays at Nuremberg Toy Museum (Spielzeugmuseum). To find more things to do, reviews, and other tourist information, use the Nuremberg trip maker tool . Traveling by train from Wurzburg to Nuremberg takes an hour. Alternatively, you can drive; or take a bus. In September in Nuremberg, expect temperatures between 22°C during the day and 10°C at night. Finish your sightseeing early on the 27th (Thu) to allow enough time to take a train to Munich. 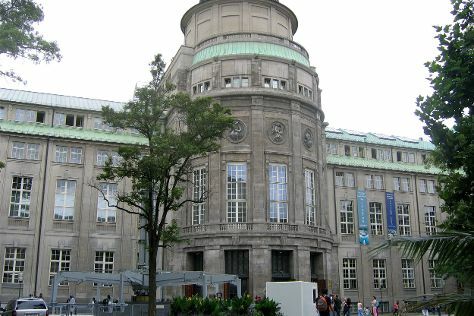 Munich is known for museums, nature, parks, nightlife, and historic sites. Your plan includes some of its best attractions: don't miss a visit to Marienplatz, explore the world behind art at New Pinakothek, steep yourself in history at Nymphenburg Palace, and engage your brain at Deutsches Museum. To see more things to do, maps, ratings, and tourist information, use the Munich trip itinerary planning tool . Take a train from Nuremberg to Munich in 1.5 hours. Alternatively, you can drive; or take a bus. In September, plan for daily highs up to 22°C, and evening lows to 9°C. Finish your sightseeing early on the 4th (Thu) so you can travel to Dresden. 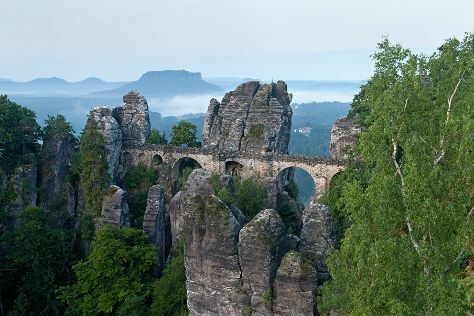 Change things up with these side-trips from Dresden: Bad Schandau (Elbe Sandstone Mountains & Basteigebiet). The adventure continues: don't miss a visit to Zwinger, pause for some serene contemplation at Sankt Martin Kirche, explore the world behind art at Gemaldegalerie Alte Meister, and examine the collection at Neues Grünes Gewölbe. To find reviews, maps, other places to visit, and other tourist information, use the Dresden holiday builder site . Getting from Munich to Dresden by flight takes about 3.5 hours. Other options: drive; or do a combination of flight and train. In October in Dresden, expect temperatures between 16°C during the day and 8°C at night. Wrap up your sightseeing on the 10th (Wed) to allow time to take a train to Berlin. Berlin is known for museums, historic sites, nightlife, parks, and shopping. 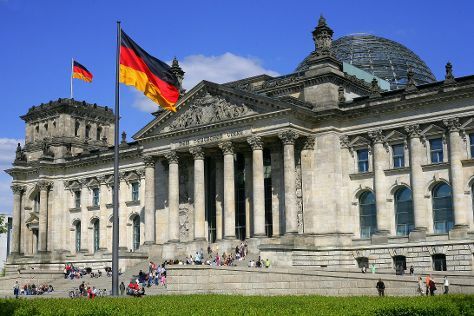 Your plan includes some of its best attractions: get a sense of history and politics at Reichstag Building, steep yourself in history at Charlottenburg Palace, make a trip to Mauermuseum - Museum Haus am Checkpoint Charlie, and examine the collection at Pergamon Museum. To see ratings, more things to do, traveler tips, and more tourist information, you can read our Berlin trip planner . Traveling by train from Dresden to Berlin takes 2 hours. Alternatively, you can drive; or take a bus. Finish up your sightseeing early on the 17th (Wed) so you can catch the train to Hamburg. Hamburg is known for museums, historic sites, nature, fun & games, and nightlife. Your plan includes some of its best attractions: see the interesting displays at Miniatur Wunderland, contemplate the long history of Alter Elbtunnel, explore the activities along Port of Hamburg, and explore the world behind art at Hamburger Kunsthalle. For maps, other places to visit, traveler tips, and tourist information, go to the Hamburg day trip planner. Take a train from Berlin to Hamburg in 2 hours. Alternatively, you can drive; or take a bus. In October, daytime highs in Hamburg are 16°C, while nighttime lows are 9°C. Wrap up your sightseeing by early afternoon on the 20th (Sat) to allow time for travel to Baden-Baden. 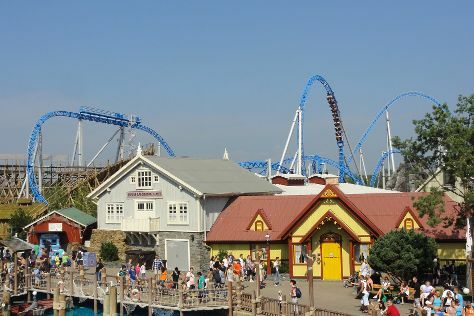 Venture out of the city with trips to Schwarzwald Idylle (in Baiersbronn), Heidelberg (Altstadt (Old Town) & Heidelberg Castle (Schloss Heidelberg)) and Europa-Park (in Rust). The adventure continues: see the interesting displays at Museum Frieder Burda, make a trip to MerkurBergbahn, take in the awesome beauty at Merkur, and soothe aching muscles at some of the top local wellness centers. For where to stay, traveler tips, and other tourist information, you can read our Baden-Baden online route maker . Getting from Hamburg to Baden-Baden by combination of flight and bus takes about 4 hours. Other options: do a combination of flight, tram, and train; or drive. In October, plan for daily highs up to 18°C, and evening lows to 9°C. Wrap up your sightseeing on the 24th (Wed) to allow time to drive to Trier. 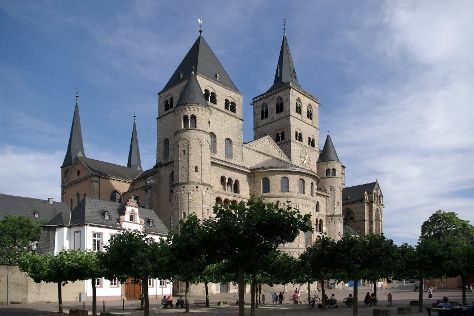 Trier is known for historic sites, shopping, museums, wineries, and childrens museums. Your plan includes some of its best attractions: take in the spiritual surroundings of St. Peter's Cathedral (Dom), see the interesting displays at Rhineland Museum (Rheinisches Landesmuseum), pause for some serene contemplation at St. Anthony's Church, and explore the ancient world of Imperial Roman Baths. For other places to visit, ratings, and other tourist information, use the Trier trip planning website . Getting from Baden-Baden to Trier by car takes about 3 hours. Other options: take a train; or do a combination of train and bus. Expect a daytime high around 15°C in October, and nighttime lows around 7°C. Finish your sightseeing early on the 28th (Sun) to allow enough time to travel to Locarno. Locarno's Mediterranean climate, palm trees, and 2,300 hours of sunlight per year make this city the warmest in Switzerland. 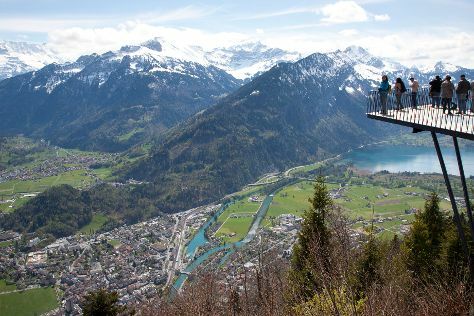 Get out of town with these interesting Locarno side-trips: Bumblebee Hanggliding Interlaken (in Matten bei Interlaken), Lauterbrunnen (Trümmelbachfälle & Lauterbrunnen Valley Waterfalls) and Interlaken (Harderkulm, Funky Chocolate Club Switzerland, & more). There's more to do: tour the pleasant surroundings at First and pause for some serene contemplation at Sacromonte e Santuario Madonna del Sasso. To see more things to do, where to stay, other places to visit, and more tourist information, you can read our Locarno online trip itinerary builder . Use the Route module to find suitable travel options from Trier to Locarno. Traveling from Trier in October, expect nights in Locarno to be about the same, around 10°C, while days are somewhat warmer, around 20°C. Finish your sightseeing early on the 1st (Thu) so you can travel back home.